Umhappen presents KILL THE PM by Fregmonto Stokes, at the Old 505 Theatre. Hibernian House, Level 5, 342 Elizabeth St., Surry Hills, October 8 - 26. KILL THE PM, a new Australian play. Four young people, Rowan (Nicholas Hiatt), Flick (Zoe Jensen), Pete (Michael McStay) and Naomi (Lily Newbury-Freeman), meet in an apartment overlooking a busy traffic way, along which the Prime Minister will travel, preparing for a planned assassination. There are fetid discussions reflecting the various philosophical and political standpoints of each, and an interaction between all four that seems to be undermining the cohesion of the task at hand. A murder of one of their number ensues. And, gradually, the play swerves into surreal realms with a threat from "The Reptilians!!!! ", and I got lost, and disengaged. The four actors handle the witty play with some aplomb, but the Director, James Dalton, has not found a seamless journey for the audience to follow. It seems that the actors play to themselves for themselves and tend to forget to tell the story with maximum clarity for the audience. We are asked to watch, look, but not imaginatively participate, create with them. Catch what you can. Subjective self-involvement, without objective craft engagements with the audience, the modus operandi of this company of actors. The 505 space has been turned around from its usual orientation (Set and Costume Design, by Dylan Tonkin. 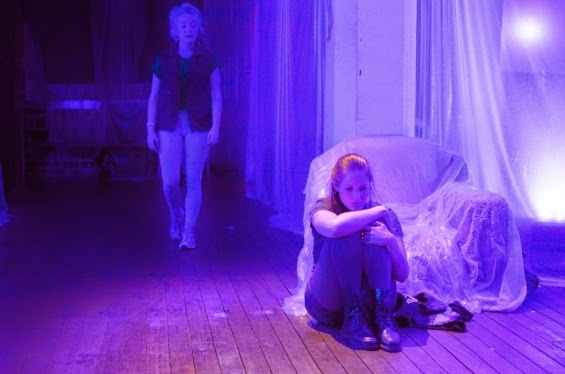 Lighting, by Benjamin Brockman), and the many real doorways, windows, and shabby furniture draped, all, in plastic, are employed to create the atmosphere of a space spookily familiar. Whether it was the physical characteristics of Mr Hiatt or not, I kept imagining Lee Harvey Oswald, and then 'recognising' the Old 505 space as an ancillary room in the Dallas Book Depository! Fregmonto Stokes, the writer, was, we are told, inspired by Fyodor Dostoyevsky's novel, THE DEVILS (THE POSSESSED) of 1872 - the novel that, as predicted by Dostoyevsky himself, was denounced by radical critics as the work of a reactionary renegade. The Czarist authorities were not happy. This play, KILL THE PM, according to notes in the program hand-out, has provoked, whether seen or read or not, some right wing attack, on the play, led by none other than Andrew Bolt. That Mr Bolt has been moved to condemn this play, maybe, should encourage some of you to find out more. The play was actually written over a year ago and is, say the artists presenting the work, assuredly, a work of fiction. Assuredly.